Looking for an easy and fast lunch recipe? How about an asparagus salad? It takes only minutes to prepare and gives you the energy you need to face the busy shopping season. With only 10 days away from Christmas, I bet you are a busy bee finishing shopping and preparing for the upcoming parties! If you are like me, you may go shopping during your lunch break. It’s convenient and it avoids shopping at night with whining kids! But in order to get through this hectic holiday season, you need to eat a healthy lunch, sleep well and exercise! (Ok maybe forget about the exercise, you will do it after the holiday season). But is very important to eat healthy meals to give you the energy to finish all what you have to do! Healthy meals don’t have to be complicated! You just need to have the ingredients on hand! One of my favorite easy and fast lunch recipes are salads! They are easy to prepare and healthy! Besides you don’t feel bloated after! (you know that kind of feeling you have after eating pasta or pizza ). 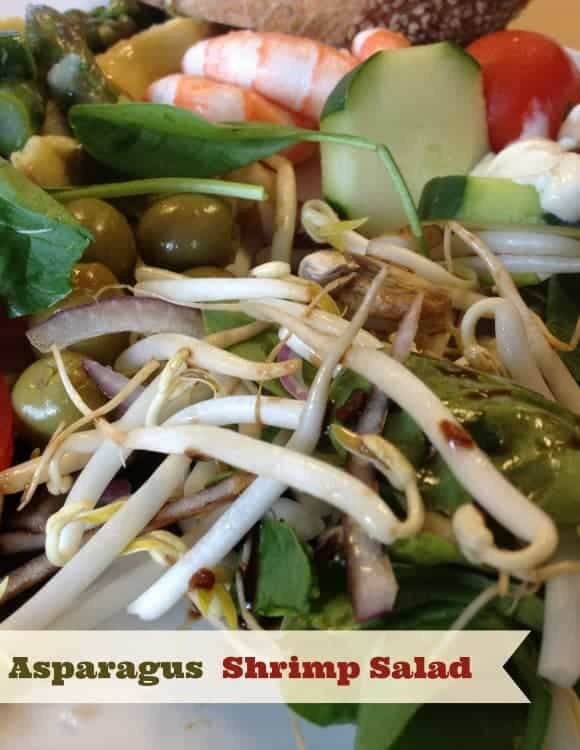 Let’s take a look at this delicious asparagus and shrimp salad recipe! I am sure you will make very often! Asparagus Salad: An easy and fast lunch recipe for those busy days! 4 asparagus trimmed and cut into 2 inch pieces. 1/2 cup of cooked shrimps for salads! I use frozen cooked shrimps that I thaw! I usually buy my shrimps at Costco because my kids love topping their pizza with shrimps! 1/2 cup of mushrooms cut in half! Combine all those dressing ingredients in a cup and shake well! Add the dressing for this asparagus and shrimp salad! Voila! Easy peasy! 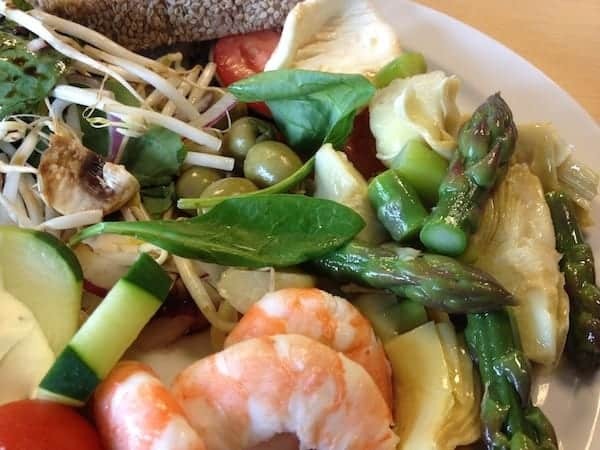 What do you think of this asparagus and shrimp salad recipe? Isn’t’ it an easy and fast lunch option? What would you add to this salad recipe? What would you remove from it! I would love to hear from you! For more salad recipes, check out our Quinoa Salad with Asparagus and Goat Cheese and our Spinach Salad with Cranberries! I would have to switch from green to black olives but other than that it looks like a very yummy recipe! Oh that looks delicious! I love shrimp and asparagus! Never thought to combine them though. This is awesome! Sounds delicious! Lunch is always hard for me to eat healthy, I need to make more salads like this. Yummo — I am always looking for asparagus recipes and this ones sounds like a nice flavor combo! thank you Sarah! It is! YUM this does look like a great lunch idea!! I love how you can whip it up rather quickly! !